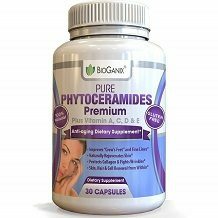 Today we review Bioganix Pure Phytoceramides. With many vitamins and minerals, this supplement will help to stop aging and help rejuvenate skin. By adding this formula to your daily regimen, you will start to fight wrinkles and improve your skin, hair, and other cells. These vitamins are essential to help keep your skin looking young. The one ingredient we noticed is missing from this supplement is wheat extract. This extract also helps to reverse the look of aging and is commonly found in this type of supplement. As this supplement is gluten free, they are unable to use wheat extract in the formula. Additionally, this supplement only contains 40 mg of rice-derived phytoceramides per dose. 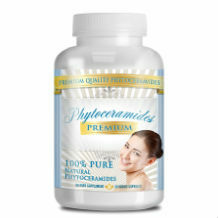 The optimal daily dosage of phytoceramides is 350 mg, which shows that these capsules are seriously lacking one of the main ingredients and may not be as effective as other similar products. This supplement comes in an easy to take, once per day capsule. You should take the daily dose with food, but it is not specified if there is a time of day that is optimal to take these capsules. While there are no warnings or listed side effects, one customer review stated their own warning about vitamin toxicity. If you are taking other vitamins and supplements, you need to be aware of the levels of non-water soluble vitamins you are taking so you do no overdose on these vitamins. You can speak with your healthcare provider to discuss all of the supplements you are taking to determine the proper amount of vitamins you need. Each bottle contains 30 capsules, or a one month supply. If you make a one time purchase, the cost of each bottle will be $16.97. This manufacturer does offer the option to subscribe to their auto-shipment program to save 10%. It is important to be weary of these types of offers, as they store your credit card information and can be extremely difficult to cancel. Bioganix guarantees all of their products for 60 days from the date of purchase. If you find yourself unhappy with your purchase, you can write a letter to their customer service line explaining your dissatisfaction, and they will offer you a full refund. Just note that the guarantee is only good for 60 days from the date of purchase, not the date of delivery, so if it takes a long time for delivery, you will not have much time to try the supplement before requesting a refund. There are a few things we liked about Bioganix Pure Phytoceramides. The formula comes in an easy to take, once daily capsule. Also, the prices for this supplement is not too expensive. Unfortunately, we did have many concerns regarding this product. The phytoceramides are derived from rice and not wheat. Secondly, there are only 40 mg of this nutrient when there should be over 300 mg to see the best results. Lastly, the offer an auto-shipment program which is just a way to overcharge you for future purchases you may not want. For these reasons, we cannot recommend this supplement to help you stop the formation of new wrinkles.